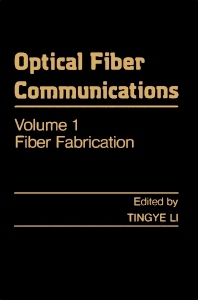 Optical Fiber Communications, Volume 1: Fiber Fabrication focuses on the science, engineering, and application of information transmission through optical fibers. This book discusses the materials and processes for fiber fabrication, fiber theory, design, and measurement, as well as passive components, cabling, active devices, systems, and applications. Organized into five chapters, this volume starts with an overview of the modified chemical vapor deposition (MCVD), the outside vapor deposition (OVD), and the vapor-phase axial deposition (VAD) processes. This text then explores the important development with respect to the drawing of glass fibers, particularly those that serve as optical waveguides in telecommunications applications. Other chapters discuss the progress in fiber strength from short-length research fibers to large quantities that give confidence in the manufacturability of high-strength, long-length fibers. The final chapter discusses the advances in the technologies of optical-fiber manufacture. This book is a valuable resource for process engineers, technicians, scientists, and optical fiber manufacturers. 5.1. Fiber Manufacturing at AT&T Technologies, Inc.